Mon Eng Dao Near Mon Jam the famous attractions of Chiang Mai. Surrounded by mountains and nature Near strawberry plantations and fruit and vegetable plots. The way of life of hilltribes is simple. And another place to have a beautiful view by 360 degrees away, cool weather and very cold at night. 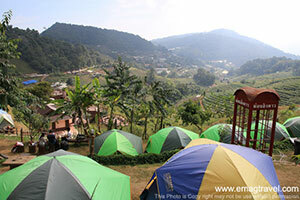 Travel Only 40 minutes by car from Chiang Mai city, take Highway 107, Chiang Mai - Fang. Go straight to Mae Rim. At km 17, turn left. Take Highway No. 1096 Mae Rim - Samoeng. At 15 km, turn right at Ban Pong, go straight for another 6 km, then go for about 400 meters, there are signposts along the route. Need to rent a car.